We are accompanying James Parton, a well-known author in his day, as he explores Pittsburgh in an article he wrote for Atlantic Monthly 149 years ago. Now, he ventures into the darkest dark. He follows a mule and a “black white boy” into a coal mine under what is now Mount Washington. The “great fact” of Pittsburg is coal. Iron and copper can better afford to come to coal to be melted, than send for coal to come and melt them. All those hills that frown down upon Pittsburg, and those that rise from the rivers back of Pittsburg, have a stratum of coal in them from four to twelve feet thick. This stratum is about three hundred feet above the water’s edge, and about one hundred feet from the average summit of the hills. . .
To observe the whole process of getting coal out of the hills, it is only necessary to walk half a mile from the city. Cross one of the bridges over the Monongahela, walk up the hill that rises from the banks of that tranquil stream, and you behold, in the side of the hill, a round hole about large enough for a man to stand upright in. In “A Family Coal Mine, a Pittsburgh Sketch,” children remove coal from an abandoned mine on Coal Hill (Mount Washington). The wood engraving by Harry Fenn appeared in an 1871 issue of Every Saturday magazine. This cavity has smooth walls of coal, and there is a narrow railroad track in it. The air within is neither damp nor chilly, and often delicate flowers are blooming about the entrance. After walking a hundred yards or so, strangers usually think it best to go no farther. It is as dark in there as darkness itself, and as silent as a tomb. The entrance shows like a distant point of light. The visitor listens for the sound of the pickaxe, or the rumble of a coal-car; but nothing breaks the horrid silence of the place, and, re-tracing his steps, he sees with pleasure the point of light expanding into a round O.
Reassured, he peers again into the mountain’s heart, and discerns in the far distance, a speck of light. This speck slowly, very slowly, approaches. A low and distant rumble is heard. The speck of light enlarges a little. A voice is heard, — the voice of a boy addressing an observation to a mule. The light, that was but a speck, begins now to disperse the gloom; and at last we discover that it is a lamp fixed upon a mule’s head, and that the mule is drawing two or three car-loads of coal, and is driven by a perfectly black white boy, who also has a lamp upon his head. The coal is immediately dumped, the mule is attached to the other end of the train, and re-enters the black hole. A stranger who has a proper respect for his garments will hesitate to climb over into that exceedingly black car; but curiosity is frequently stronger than principle, and there are travellers who will ride into the black bowels of the earth if they see an empty car going thither. When a mine is opened, the first thing, of course, is to make a straight passage into it; but on each side of the passage “rooms” are op- ened, one man being assigned to each, who excavates the apartment in solitude. The partitions left between the “rooms” keep the hill from settling down, and they remain intact until the seam is worked out. Then the partitions are knocked away and the coal removed. The hill is then only supported by upright logs, two or three feet thick. After a long ride in the car, signs of life appear; a speck of light is seen in the distance, and the click of a pickaxe is faintly heard. The train of empty coal-cars stops at the door of a “room,” and one of them is cast off, and pushed into this apartment by a turnout. The visitors alight as best they can, and find themselves in the coaliest coal-hole ever known. The visitors alight as best they can, and find themselves in the coaliest coal-hole ever known. 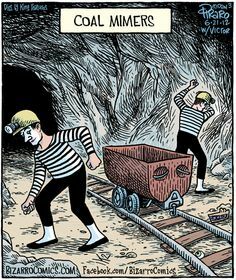 When a miner finds himself before a wall of coal, from which he is to excavate convenient masses of that precious commodity, the first thing he does is to “bear in.” To “bear in” is to get down upon your knees, and with a pickaxe cut deeply in at the bottom of the seam of coal,—as far in as you can reach, even by lying down. When the miner has made his gash, three feet deep and six feet wide, it is very easy by wedges, or even by the pickaxe alone, to bring down all the upper part of the seam in pieces small enough to handle. Our miner was bearing in, at the moment of our entrance, with enthusiasm, owing to his being a little behind with his heap for the next load. Each miner expects to have a car-load ready when his car comes, and he lays out his work accordingly. His task is done when he has dug out the coal, and loaded it upon the car. And it is for doing these two things that he is paid a certain sum per bushel. Our eager miner, hearing voices in his room, rose at length, and dimly revealed himself by the light of a very small tin lamp that hung loosely on his forehead. What a picture he was, as he peered over the heap of coal, with his black cap fitting close to his head, his dangling tin lamp, his coaly visage, his red lips and white teeth, and his black eyes glistening in the midst of the dull black of the rest of his countenance! He looked the Spirit of the Coal-mine. He was, however, introduced to the intruders as “Mr. Gallagher”; and a very merry, social, pleasant fellow he was. People come into the mines prepared to regard with compassion these grimy workers in the eternal dark; but, on the contrary, they find them the gayest of men, very cheerful and companionable, with a keen sense of independence and personal dignity. We discovered at once that this man of the dangling lamp was indeed Mister Gallagher. He begins work when he likes, works as fast as he likes, or as slow, and goes home when he likes. His “room” is his own against the world; and when he has dug out of it his regular hundred bushels, which he usually accomplishes about three o’clock in the afternoon, he takes up his oil-bottle and his dinner-kettle, gets upon a load of coal, rides to day-light, and saunters home. When he has had his thorough Saturday afternoon wash, and has put on his fine Sunday broadcloth, he looks like a pale, muscular poet. The sun does not brown his skin, nor the wind roughen it. He works in the dark, in a still air, and at a uniform temperature of about sixty degrees (closer to 50 degrees on modern thermometers), the year round. If he has a fancy to get rich, he can. Many of the proprietors about here once dug coal at three-quarters of a cent per bushel. The people who live near the mines along the Monongahela speak well of the miners as a class. They are proud, honest, and orderly. . .
We asked “Mr. Gallagher” whether the practice of his vocation was attended by any danger. Sealed coal mine along Painters Run Road in Mount Lebanon. Pitt’s Geology department ranks it the best place to see what remains of the vaunted Pittsburgh Coal Seam. Like most other men in perilous employments, he protested that there was not the least danger, if a man was only careful. In proof of which he adduced the fact, that in this mine only one man had been killed in eleven months, and he was killed by a piece of “horseback” falling on him. Horseback is a thick scale of remarkably heavy stone that is always found at the top of the stratum of coal, and which ought to fall when the coal is cut away from under it. But masses of it often adhere to the roof of the mine, and cannot be dislodged without more labor than a miner is always willing to bestow. In almost every “room” of a mine, therefore, there will be heavy chunks of horseback clinging to the roof, which are sure to fall soon, and may fall at any instant. The solitary occupant of the room intends to avoid standing under these masses. He also intends to employ his first leisure in prying them off. But time passes; he forgets, in the heat of his work, the overhanging peril; and some day the solitary worker in the next room notices that his neighbor’s pickaxe has ceased to strike. Down there in the bowels of the earth, each man working by himself, separated from his fellows by a wall of coal several feet thick, men acquire a strange power of knowing how it fares with their friends in the rooms adjoining. They can tell what they are doing, whether they are forward with their load or behind with it, whether the coal is working easily or hard, whether they are working merrily or dully, whether they are good-tempered or cross. The sudden cessationi of all noise in a room, at an hour when work is going on, soon attracts attention, and the poor miner is found with his lamp and his life crushed out, under half a ton of horseback. This is said to be the only danger to the miners of the Pittsburg Seam. If noxious gases are generated, it is easy to open a passage through to the other side of the hill for ventilation, or make a chimney through the roof. . . The population of the coal region near Pittsburg is about thirtyfive thousand, and seven thousand of these are employed in and about the mines. The annual product of the mines is something near two millions and a half of tons, of which one third is consumed at Pittsburg . . .
EDITOR’S NOTE: The unabridged version of Parton’s travelogue in the Atlantic Monthly is available here.